What an important question at a time when the world rhetoric seems to be about ‘divide and rule’, finding and exaggerating the differences between us, creating reasons for seeing each other as ‘other’, as ‘them’ not ‘us’, creating reasons for keeping the good stuff for ourselves and keeping ‘them’ out! Real educators that know our role to be that of catalyst for the development of globally engaged citizens of the world and of the human family, know we have to provide an alternative rhetoric of ‘us’, of ‘we not me’, of community spirit, of Ubuntu, of finding our real value and identity through our empathy and through our active pursuit of skills, knowledge and values that will enable us to build others as we grow and not at the expense of others. EducAid prioritises equality as one of its key values. A key activity every day, is Ubuntu time when children remember that Ubuntu is the true African meaning of humanity and nominate each other for Ubuntu stars for acts of kindness throughout the day. 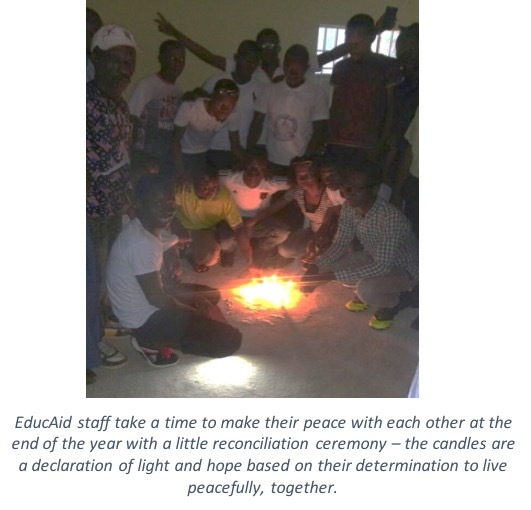 A regular forum is created for staff and students to make peace with each other, to forgive and strive again to work as one, in reconciliation services where each participant has a candle that they light when they have made their peace with anyone with whom they have had a conflict or difference. The EducAid motto is ‘Love and Do as You Will’, meaning if, first, you love, all your further actions will be in the spirit of love. We teach this. We role-model this. We challenge each other and our students to strive more and more for this. We have a way of working that we call ‘Every Voice Counts’ through which, we endeavour to teach and learn how to respect each member of the EducAid family so that we never permit ourselves to forget each other’s needs and priorities. Our schools are divided into tutor groups which are divided into families. Each family of ten or so children is headed by an older child who supports the family members in learning how to look after each other as they cook, do chores, study, eat and launder together, no matter where they originate from or what their history has been before joining the school. Last year, we worked together with a few schools across the world on a ‘Democracy Project’ through which we encouraged each other to take action against any injustice around us that we could tackle. Next year, we will partner with a wonderful partner school (Coldfall Primary School) to focus on the 9 Habits of Empathy identified in Dr Michelle Borba’s exciting book Unselfie. Of course, as a school, we have a responsibility to our students to provide the best academic education we possibly can, but we are quite clear that, in itself, this is not enough. We have to prepare our children to be examready and life ready. To be life ready, we must be able to work well as part of the communities we find ourselves in. We have to be able to build constructive relationships, find ways through and round difficult relationships and situations. EducAid students learn to care and to create positive living and working communities, as a key part of their membership of the family. Two EducAid staff, one of whom was a founding pupil of EducAid Lumley, joined the University of Makeni to undertake a degree course studies only at weekends. This course had previously only ever had students graduating with 3rd class degrees. The two of them took it upon themselves to call the entire class as they all started and ask them to commit to a ‘nobody gets left behind’ stance. Throughout the 4 years they supported their colleagues in maintaining this attitude. When one wanted to drop behind, they worked together to bring them back on course. At the end of the day, despite the multitudinous challenges involved in studying while working and at a distance away from their working place, they both came out with 1st class degrees and nobody in the class got below 2nd class. Empathy and caring build our success. They don’t endanger it as popular rhetoric would have us believe. Ask your children’s school, your parish church, your neighbour’s book club, etc etc to invite Miriam or another EducAid representative to come and speak. Become a lecturer on our Business Administration & Management degree course for 2 weekends.